Jerrad Lopes is the founder of the ministry/podcast “Dad Tired”. Dad Tired is a gospel-centered outreach to husbands and fathers meant to encourage and challenge men to faithfully follow hard after Christ, in all of our short comings and failures. 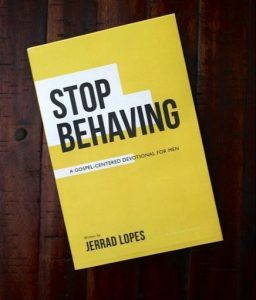 Jerrad Lopes recently authored Stop Behaving, a daily devotional book that is split into four one-week sections. In this devotional, Jerrad practically applies the Gospel to everyday life on every page. He makes the point that, as men, so much seems to be focused on behavior management. We are told that we are to be This and be doing That in order to be a good husband or a good father. We are hounded by these pressures from just about every angle. Stop Behaving points out that scripturally, we as husbands and fathers don’t require changed behavior, but require a changed heart that only Jesus can provide. From there, we read how the Gospel changes the way that we serve and love our wife, the way that we relate to our children and view their behavior, and the way that we view our job and where we find our worth in an increasingly performance driven world. This devotional has been a great encouragement and challenge to me, as I am reminded of my insufficiency and general unworthiness in my roles as a husband and father and am driven to the throne of grace in order that Christ be made known. Here is the link to Jerrad Lopes website, Dad Tired where you can purchase the book and listen to his podcast. The above image was obtained from the Dad Tired website.